Louisa May Alcott's What the Bell Saw and Said is about six bell spirits gathering on Christmas Eve to assess the world's state of affairs. Some say it might have served as Alcott's State of the Union Address. You might also like Alcott's A Christmas Dream, and How It Came to Be True . "Bells ring others to church, but go not in themselves." "Well, brothers, are your reports ready of the year that now lies dying?" "My report isn't all I could wish. You know I look down on the commercial part of our city and have fine opportunities for seeing what goes on there. It's my business to watch the business men, and upon my word I'm heartily ashamed of them sometimes. During the war they did nobly, giving their time and money, their sons and selves to the good cause, and I was proud of them. But now too many of them have fallen back into the old ways, and their motto seems to be, 'Every one for himself, and the devil take the hindmost.' Cheating, lying and stealing are hard words, and I don't mean to apply them to all who swarm about below there like ants on an ant-hill--they have other names for these things, but I'm old-fashioned and use plain words. There's a deal too much dishonesty in the world, and business seems to have become a game of hazard in which luck, not labor, wins the prize. When I was young, men were years making moderate fortunes, and were satisfied with them. They built them on sure foundations, knew how to enjoy them while they lived, and to leave a good name behind them when they died. "Now it's anything for money; health, happiness, honor, life itself, are flung down on that great gaming-table, and they forget everything else in the excitement of success or the desperation of defeat. Nobody seems satisfied either, for those who win have little time or taste to enjoy their prosperity, and those who lose have little courage or patience to support them in adversity. They don't even fail as they used to. In my day when a merchant found himself embarrassed he didn't ruin others in order to save himself, but honestly confessed the truth, gave up everything, and began again. But now-a-days after all manner of dishonorable shifts there comes a grand crash; many suffer, but by some hocus-pocus the merchant saves enough to retire upon and live comfortably here or abroad. It's very evident that honor and honesty don't mean now what they used to mean in the days of old May, Higginson and Lawrence. "They preach below here, and very well too sometimes, for I often slide down the rope to peep and listen during service. But, bless you! they don't seem to lay either sermon, psalm or prayer to heart, for while the minister is doing his best, the congregation, tired with the breathless hurry of the week, sleep peacefully, calculate their chances for the morrow, or wonder which of their neighbors will lose or win in the great game. Don't tell me! I've seen them do it, and if I dared I'd have startled every soul of them with a rousing peal. Ah, they don't dream whose eye is on them, they never guess what secrets the telegraph wires tell as the messages fly by, and little know what a report I give to the winds of heaven as I ring out above them morning, noon, and night." And the old spirit shook his head till the tassel on his cap jangled like a little bell. "'Treat our dead boys tenderly, and send them home to me.'" He ceased, and all the spirits reverently uncovered their gray heads as a strain of music floated up from the sleeping city and died among the stars. "Like yours, my report is not satisfactory in all respects," began the second spirit, who wore a very pointed cap and a finely ornamented cloak. But, though his dress was fresh and youthful, his face was old, and he had nodded several times during his brother's speech. "My greatest affliction during the past year has been the terrible extravagance which prevails. My post, as you know, is at the court end of the city, and I see all the fashionable vices and follies. It is a marvel to me how so many of these immortal creatures, with such opportunities for usefulness, self-improvement and genuine happiness can be content to go round and round in one narrow circle of unprofitable and unsatisfactory pursuits. I do my best to warn them; Sunday after Sunday I chime in their ears the beautiful old hymns that sweetly chide or cheer the hearts that truly listen and believe; Sunday after Sunday I look down on them as they pass in, hoping to see that my words have not fallen upon deaf ears; and Sunday after Sunday they listen to words that should teach them much, yet seem to go by them like the wind. They are told to love their neighbor, yet too many hate him because he possesses more of this world's goods or honors than they: they are told that a rich man cannot enter the kingdom of heaven, yet they go on laying up perishable wealth, and though often warned that moth and rust will corrupt, they fail to believe it till the worm that destroys enters and mars their own chapel of ease. Being a spirit, I see below external splendor and find much poverty of heart and soul under the velvet and the ermine which should cover rich and royal natures. Our city saints walk abroad in threadbare suits, and under quiet bonnets shine the eyes that make sunshine in the shady places. Often as I watch the glittering procession passing to and fro below me. I wonder if, with all our progress, there is to-day as much real piety as in the times when our fathers, poorly clad, with weapon in one hand and Bible in the other, came weary distances to worship in the wilderness with fervent faith unquenched by danger, suffering and solitude. "But I've hopes of them, and lately they have had a teacher so genial, so gifted, so well-beloved that all who listen to him must be better for the lessons of charity, good-will and cheerfulness which he brings home to them by the magic of tears and smiles. We know him, we love him, we always remember him as the year comes round, and the blithest song our brazen tongues utter is a Christmas carol to the Father of 'The Chimes!'" As the spirit spoke his voice grew cheery, his old face shone, and in a burst of hearty enthusiasm he flung up his cap and cheered like a boy. So did the others, and as the fairy shout echoed through the belfry a troop of shadowy figures, with faces lovely or grotesque, tragical or gay, sailed by on the wings of the wintry wind and waved their hands to the spirits of the bells. As the excitement subsided and the spirits reseated themselves, looking ten years younger for that burst, another spoke. A venerable brother in a dingy mantle, with a tuneful voice, and eyes that seemed to have grown sad with looking on much misery. "He loves the poor, the man we've just hurrahed for, and he makes others love and remember them, bless him!" said the spirit. "I hope he'll touch the hearts of those who listen to him here and beguile them to open their hands to my unhappy children over yonder. If I could set some of the forlorn souls in my parish beside the happier creatures who weep over imaginary woes as they are painted by his eloquent lips, that brilliant scene would be better than any sermon. Day and night I look down on lives as full of sin, self-sacrifice and suffering as any in those famous books. Day and night I try to comfort the poor by my cheery voice, and to make their wants known by proclaiming them with all my might. But people seem to be so intent on business, pleasure or home duties that they have no time to hear and answer my appeal. There's a deal of charity in this good city, and when the people do wake up they work with a will; but I can't help thinking that if some of the money lavished on luxuries was spent on necessaries for the poor, there would be fewer tragedies like that which ended yesterday. It's a short story, easy to tell, though long and hard to live; listen to it. "Down yonder in the garret of one of the squalid houses at the foot of my tower, a little girl has lived for a year, fighting silently and single-handed a good fight against poverty and sin. I saw her when she first came, a hopeful, cheerful, brave-hearted little soul, alone, yet not afraid. She used to sit all day sewing at her window, and her lamp burnt far into the night, for she was very poor, and all she earned would barely give her food and shelter. I watched her feed the doves, who seemed to be her only friends; she never forgot them, and daily gave them the few crumbs that fell from her meagre table. But there was no kind hand to feed and foster the little human dove, and so she starved. "As the clocks struck ten, the poor child lay down, saying, as she drank the last bitter draught life could give her, 'It's very cold, but soon I shall not feel it;' and with her quiet eyes fixed on the cross that glimmered in the moonlight above me, she lay waiting for the sleep that needs no lullaby. "As the clock struck eleven, pain and poverty for her were over. It was bitter cold, but she no longer felt it. She lay serenely sleeping, with tired heart and hands, at rest forever. As the clocks struck twelve, the dear Lord remembered her, and with fatherly hand led her into the home where there is room for all. To-day I rung her knell, and though my heart was heavy, yet my soul was glad; for in spite of all her human woe and weakness, I am sure that little girl will keep a joyful Christmas up in heaven." In the silence which the spirits for a moment kept, a breath of softer air than any from the snowy world below swept through the steeple and seemed to whisper, "Yes!" "Avast there! fond as I am of salt water, I don't like this kind," cried the breezy voice of the fourth spirit, who had a tiny ship instead of a tassel on his cap, and who wiped his wet eyes with the sleeve of his rough blue cloak. "It won't take me long to spin my yarn; for things are pretty taut and ship-shape aboard our craft. Captain Taylor is an experienced sailor, and has brought many a ship safely into port in spite of wind and tide, and the devil's own whirlpools and hurricanes. If you want to see earnestness come aboard some Sunday when the Captain's on the quarter-deck, and take an observation. No danger of falling asleep there, no more than there is up aloft, 'when the stormy winds do blow.' Consciences get raked fore and aft, sins are blown clean out of the water, false colors are hauled down and true ones run up to the masthead, and many an immortal soul is warned to steer off in time from the pirates, rocks and quicksands of temptation. He's a regular revolving light, is the Captain,--a beacon always burning and saying plainly, 'Here are life-boats, ready to put off in all weathers and bring the shipwrecked into quiet waters.' He comes but seldom now, being laid up in the home dock, tranquilly waiting till his turn comes to go out with the tide and safely ride at anchor in the great harbor of the Lord. Our crew varies a good deal. Some of 'em have rather rough voyages, and come into port pretty well battered; land-sharks fall foul of a good many, and do a deal of damage; but most of 'em carry brave and tender hearts under the blue jackets, for their rough nurse, the sea, manages to keep something of the child alive in the grayest old tar that makes the world his picture-book. We try to supply 'em with life-preservers while at sea, and make 'em feel sure of a hearty welcome when ashore, and I believe the year '67 will sail away into eternity with a satisfactory cargo. Brother North-End made me pipe my eye; so I'll make him laugh to pay for it, by telling a clerical joke I heard the other day. Bellows didn't make it, though he might have done so, as he's a connection of ours, and knows how to use his tongue as well as any of us. Speaking of the bells of a certain town, a reverend gentleman affirmed that each bell uttered an appropriate remark so plainly, that the words were audible to all. The Baptist bell cried, briskly, 'Come up and be dipped! come up and be dipped!' 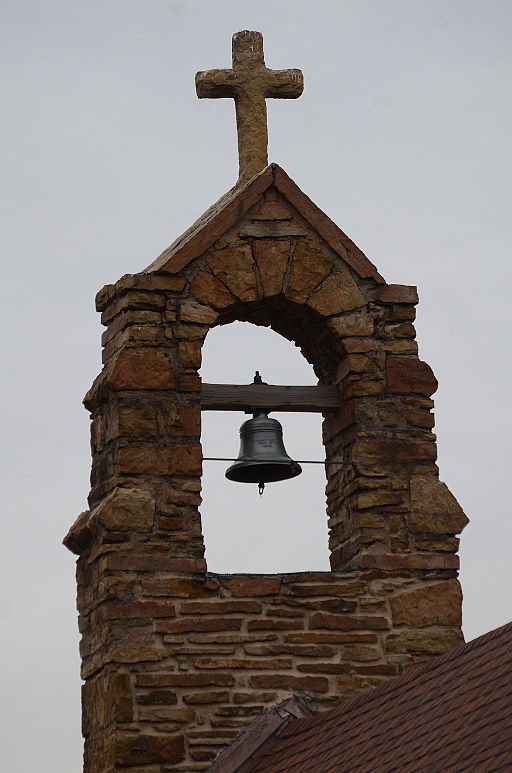 The Episcopal bell slowly said, 'Apos-tol-ic suc-cess-ion! apos-tol-ic suc-cess-ion!' The Orthodox bell solemnly pronounced, 'Eternal damnation! eternal damnation!' and the Methodist shouted, invitingly, 'Room for all! room for all!'" As the spirit imitated the various calls, as only a jovial bell-sprite could, the others gave him a chime of laughter, and vowed they would each adopt some tuneful summons, which should reach human ears and draw human feet more willingly to church. "Faith, brother, you've kept your word and got the laugh out of us," cried a stout, sleek spirit, with a kindly face, and a row of little saints round his cap and a rosary at his side. "It's very well we are doing this year; the cathedral is full, the flock increasing, and the true faith holding its own entirely. Ye may shake your heads if you will and fear there'll be trouble, but I doubt it. We've warm hearts of our own, and the best of us don't forget that when we were starving, America--the saints bless the jewel!--sent us bread; when we were dying for lack of work, America opened her arms and took us in, and now helps us to build churches, homes and schools by giving us a share of the riches all men work for and win. It's a generous nation ye are, and a brave one, and we showed our gratitude by fighting for ye in the day of trouble and giving ye our Phil, and many another broth of a boy. The land is wide enough for us both, and while we work and fight and grow together, each may learn something from the other. I'm free to confess that your religion looks a bit cold and hard to me, even here in the good city where each man may ride his own hobby to death, and hoot at his neighbors as much as he will. You seem to keep your piety shut up all the week in your bare, white churches, and only let it out on Sundays, just a trifle musty with disuse. You set your rich, warm and soft to the fore, and leave the poor shivering at the door. You give your people bare walls to look upon, common-place music to listen to, dull sermons to put them asleep, and then wonder why they stay away, or take no interest when they come. "We leave our doors open day and night; our lamps are always burning, and we may come into our Father's house at any hour. We let rich and poor kneel together, all being equal there. With us abroad you'll see prince and peasant side by side, school-boy and bishop, market-woman and noble lady, saint and sinner, praying to the Holy Mary, whose motherly arms are open to high and low. We make our churches inviting with immortal music, pictures by the world's great masters, and rites that are splendid symbols of the faith we hold. Call it mummery if ye like, but let me ask you why so many of your sheep stray into our fold? It's because they miss the warmth, the hearty, the maternal tenderness which all souls love and long for, and fail to find in your stern. Puritanical belief. By Saint Peter! I've seen many a lukewarm worshipper, who for years has nodded in your cushioned pews, wake and glow with something akin to genuine piety while kneeling on the stone pavement of one of our cathedrals, with Raphael's angels before his eyes, with strains of magnificent music in his ears, and all about him, in shapes of power or beauty, the saints and martyrs who have saved the world, and whose presence inspires him to follow their divine example. It's not complaining of ye I am, but just reminding ye that men are but children after all, and need more tempting to virtue than they do to vice, which last comes easy to 'em since the Fall. Do your best in your own ways to get the poor souls into bliss, and good luck to ye. But remember, there's room in the Holy Mother Church for all, and when your own priests send ye to the divil, come straight to us and we'll take ye in." "A truly Catholic welcome, bull and all," said the sixth spirit, who, in spite of his old-fashioned garments, had a youthful face, earnest, fearless eyes, and an energetic voice that woke the echoes with its vigorous tones. "I've a hopeful report, brothers, for the reforms of the day are wheeling into rank and marching on. The war isn't over nor rebeldom conquered yet, but the Old Guard has been 'up and at 'em' through the year. There has been some hard fighting, rivers of ink have flowed, and the Washington dawdlers have signalized themselves by a 'masterly inactivity.' The political campaign has been an anxious one; some of the leaders have deserted; some been mustered out; some have fallen gallantly, and as yet have received no monuments. But at the Grand Review the Cross of the Legion of Honor will surely shine on many a brave breast that won no decoration but its virtue here; for the world's fanatics make heaven's heroes, poets say. "The flock of Nightingales that flew South during the 'winter of our discontent' are all at home again, some here and some in Heaven. But the music of their womanly heroism still lingers in the nation's memory, and makes a tender minor-chord in the battle-hymn of freedom. "The reform in literature isn't as vigorous as I could wish; but a sharp attack of mental and moral dyspepsia will soon teach our people that French confectionery and the bad pastry of Wood, Bracdon, Yates & Co. is not the best diet for the rising generation. "Speaking of the rising generation reminds me of the schools. They are doing well; they always are, and we are justly proud of them. There may be a slight tendency toward placing too much value upon book-learning; too little upon home culture. Our girls are acknowledged to be uncommonly pretty, witty and wise, but some of us wish they had more health and less excitement, more domestic accomplishments and fewer ologies and isms, and were contented with simple pleasures and the old-fashioned virtues, and not quite so fond of the fast, frivolous life that makes them old so soon. I am fond of our girls and boys. I love to ring for their christenings and marriages, to toll proudly for the brave lads in blue, and tenderly for the innocent creatures whose seats are empty under my old roof. I want to see them anxious to make Young America a model of virtue, strength and beauty, and I believe they will in time. "There have been some important revivals in religion; for the world won't stand still, and we must keep pace or be left behind to fossilize. A free nation must have a religion broad enough to embrace all mankind, deep enough to fathom and fill the human soul, high enough to reach the source of all love and wisdom, and pure enough to satisfy the wisest and the best. Alarm bells have been rung, anathemas pronounced, and Christians, forgetful of their creed, have abused one another heartily. But the truth always triumphs in the end, and whoever sincerely believes, works and waits for it, by whatever name he calls it, will surely find his own faith blessed to him in proportion to his charity for the faith of others. Ring in the Christ that is to be.'" Then hand in hand the spirits of the bells floated away, singing in the hush of dawn the sweet song the stars sung over Bethlehem,--"Peace on earth, good will to men." Please enjoy our selections of Christmas Stories. Add What the Bell Saw and Said to your own personal library.